A high-school student from Edinburg, Texas gained a lot of attention after offering to draw people's portraits on Twitter. Over a little less than a week, the teenager received thousands of requests and became an internet sensation. It seems that the teen is not bothered at all by his poor drawing skills and continues to amuse people with his hilarious reproductions. He already has drawn around a hundred of pictures, but there are thousands of requests left, let's hope he keeps on drawing. Check out the drawings below and tell us which ones you liked the most! You can also try to get your own profile picture drawing. 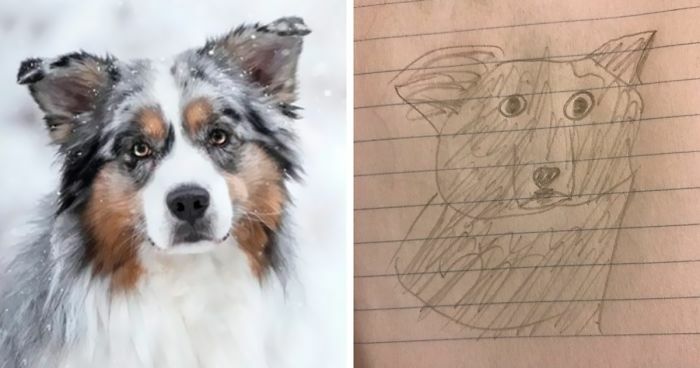 That is a simple drawing, but actually a good likeness. This one also looks a lot like that guy. The tree.The brows. The STAR WARZ. This one is fabulous. They are pretty accurate though! I actually like this one! Pro tip: Squint your eyes to see the image clearly. I love the word changing! It's clever! I love the one flower. I think I am very handsome ! Got the main points here. made this one look like he's digging for gold! love it. This is a hard pose to get ! Good for you. Covered all the curves as disgusting as they are ! Yah man, I am cool ! Love this eye opener ! wait... noooo trump is a...a...a stalker?!?!?!??! That is a great drawing. Checking out those pecks ! Get that stance and wack that puck ! Forgot to add the perfect white teeth - then it would be ok ! Trying out my new camera ! Yeah, that is close ! Let's see - how is this pose - HOT?